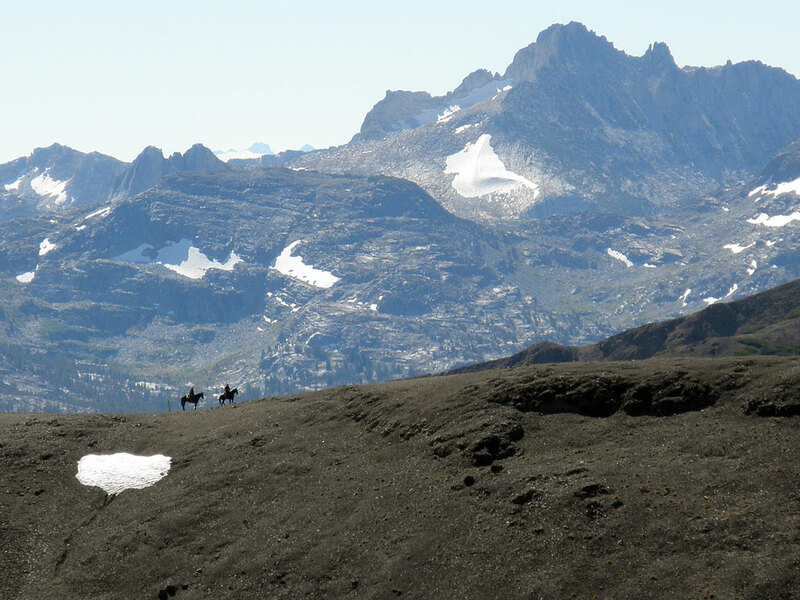 Riding the Pacific Crest Trail requires an immense amount of research – much more than the hikers need to do. Your research will happen not just at home, but while you’re on the trail too. At each resupply point, and every night at camp, consider what’s ahead of you. Check on the trail conditions if possible, call rangers, packers, the PCTA, Backcountry Horsemen members and other local equestrians. PCTA’s Trail Information Specialist, regional trail maintenance groups and regional offices are a great wealth of information. They can usually tell you whether a section has already been cleared for stock. Unfortunately, sometimes you won’t be able to find the answers that you need. That’s no reason to not look for them though. Try to talk to people who have ridden the section of trail recently. There aren’t many of them. Information coming from hikers is sometimes not terribly reliable, but is better than no information at all. Hikers do not see trail conditions through the eyes of a horse and rider. Through your research you can find out about scheduled work crews that clear fallen trees and repair damaged trails. You can learn of sections that have been closed due to fires. You can also find out about areas that might be unsafe for horses due to known hazards or deep snow. Users of the Pacific Crest Trail honor the principles of “Leave No Trace”. It is an ethical code of conduct to minimize our impact on the environment and protects the trail experience. Leave no litter. Always use tree savers to protect the bark, which is the lifeline of the trees. Before you leave your camps thoroughly scatter all horse manure so that it will decompose more quickly. Long distance riders should consider becoming trained through the equestrian Leave No Trace program. Before starting a long ride, take overnight and multi-day trips to test everything – the horse, the tack fit, the packs and all of your equipment. Get your horse used to carrying the packs. Try new techniques and let your horse become familiar with the high-lines, hobbles, tack, packs and rugged trails. You will begin to discover what you really need to bring. Hobble and bell your horse while grazing. Always keep an eye on your horse when he is hobbled. Horses can wander off, even run, while hobbled. They will also want to follow passing horses. At night, put your horse on a high-line at horse-head height and use a bell attached close to the tree saver. Knot eliminators will keep your horse from moving up and down the high-line and keep your ropes from fraying. Set your tent up nearby so you and your horse can see each other. At night, after he has eaten, be sure to shorten the drop line to about 18 inches – so that there will be no chance of his stepping over it and becoming tangled.